Life as an interiors obsessed, mama of two boys. 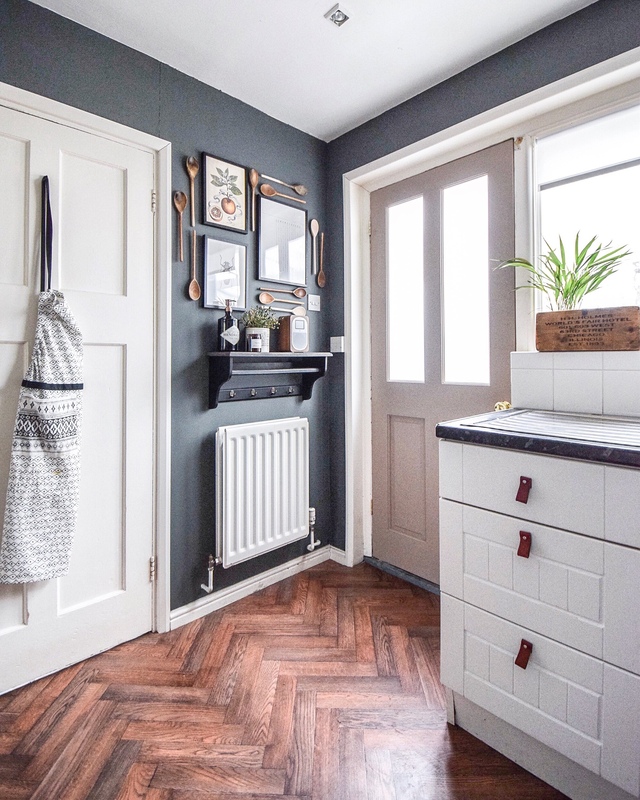 When I made-over our kitchen I didn’t do a reveal on my blog like I did with other rooms and the reason for that is because the process was so gradual I just documented it on Instagram in stages instead. Because we live in a rental it’s hard to change rooms like the kitchen, but as our landlord is really flexible, I just had to find budget friendly ways to update it as spending a fortune on a house we don’t own would just be silly. 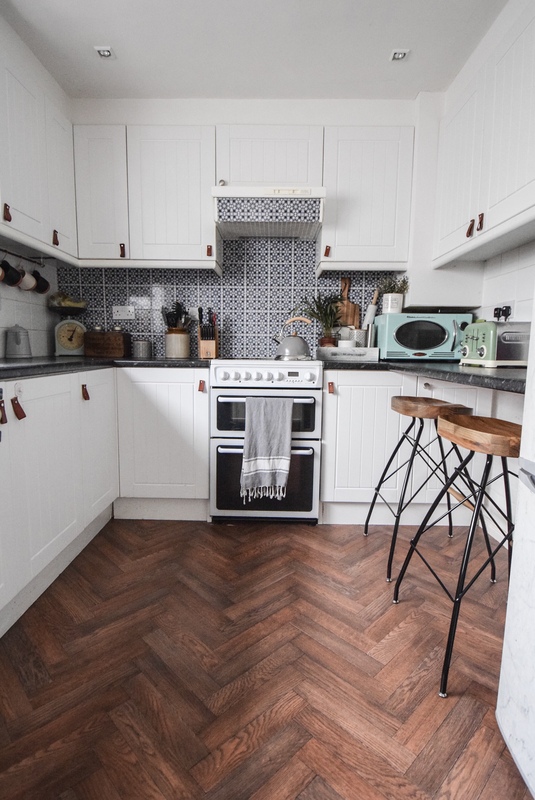 The first thing I changed was the white walls, along with the white tiles and white cupboards it all just felt too clinical. I had some Farrow & ball ‘downpipe’ left from when I painted the dining room so decided to paint the kitchen with it too. Because the majority of the kitchen is filled with tiles, that means the only empty wall space is a section above the radiator. I tried to think of creative ways to fill the space other than just putting prints on the wall when I had a brainwave. 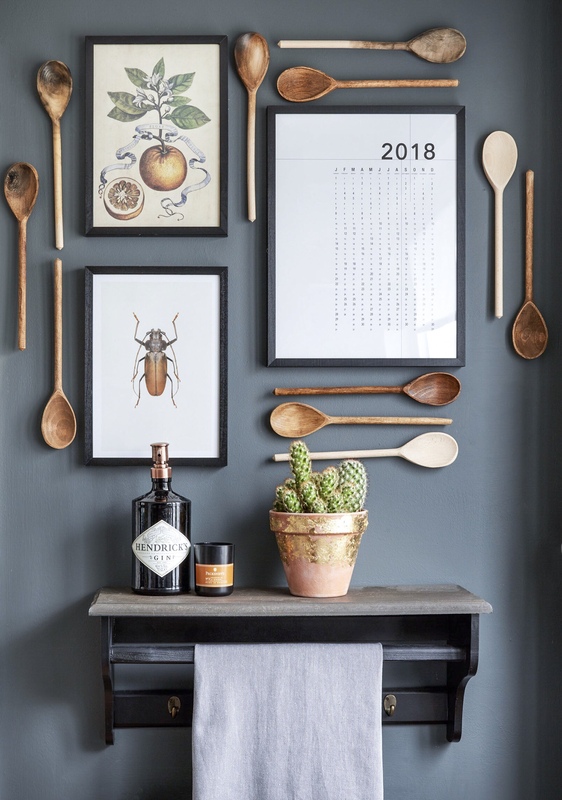 ‘Old wooden spoons would look great against the dark paint’ I thought, but after researching vintage wooden spoons it occurred to me that it would cost quite a bit. So instead, I bought a pack of brand new wooden spoons and burned and stained them myself. I then used them to frame some prints I got from Desenio. I always get asked how I attached the spoons to the wall and the answer is command hanging strips! They are a must have for renters. The door next to that wall was an absolute bargain, I got it brand new from gumtree for £15! It was pine so I painted it in Farrow and Ball ‘Dead Salmon’ which I think works so well against the other colours in the room. That door leads out to our utility room. 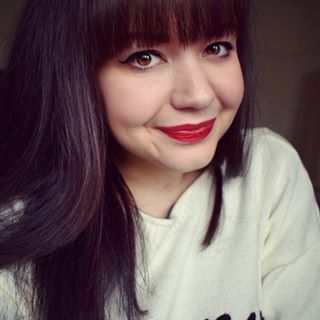 The floor was definitely the most drastic change I made. Before, it was a gross, flesh coloured tile imitation vinyl, which we have replaced with a much more tasteful parquet style vinyl that my dad kindly laid for us. The vinyl is from Online carpets and was around £100 for the whole room. I have to say it looks really realistic, and people actually have to touch it to realise it isn’t real wood. One really small but effective change I made was changing the handles on the drawers and cupboards. I haven’t got round to finishing them yet as you may notice, but I changed them from standard chrome knobs, to real leather pulls. I actually made the pulls myself but purchasing a couple of strips of leather from eBay, cutting it in to six inch strips, folding in to a pull shape and then drilling through to make the hole. I then used a nut and bolt to attach them. I mentioned before that all the tiles were white so I desperately wanted to change that but wasn’t quite sure how. When I began researching I came across tile stickers which I had no idea existed! I mean what a genius idea!! I got some from eBay that have now been on over a year and haven’t budged! I clean them and cook near them and they still look as good as the day I put them on. Such a great solution for renters or renovators on a budget! The latest addition to our kitchen are these beautiful new kitchen bar stools that were kindly gifted to me from Cult furniture. 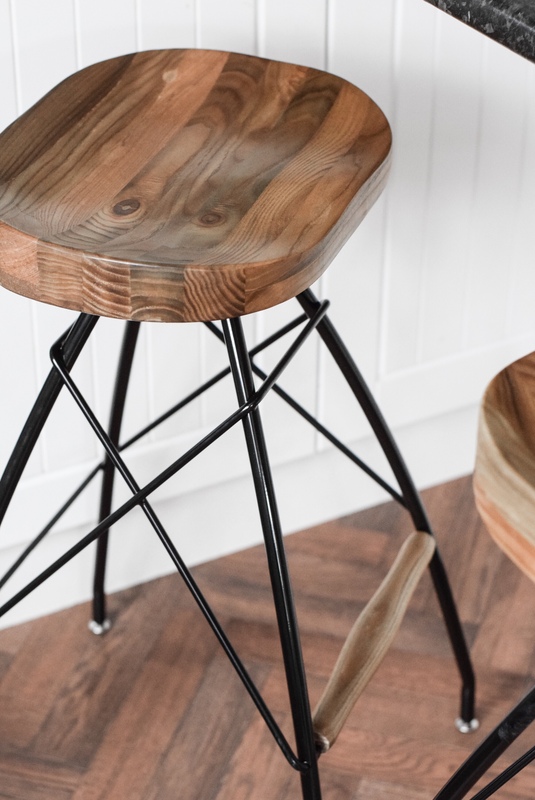 The stools come in a variety of different finishes and colours so committing to one was a tough choice. 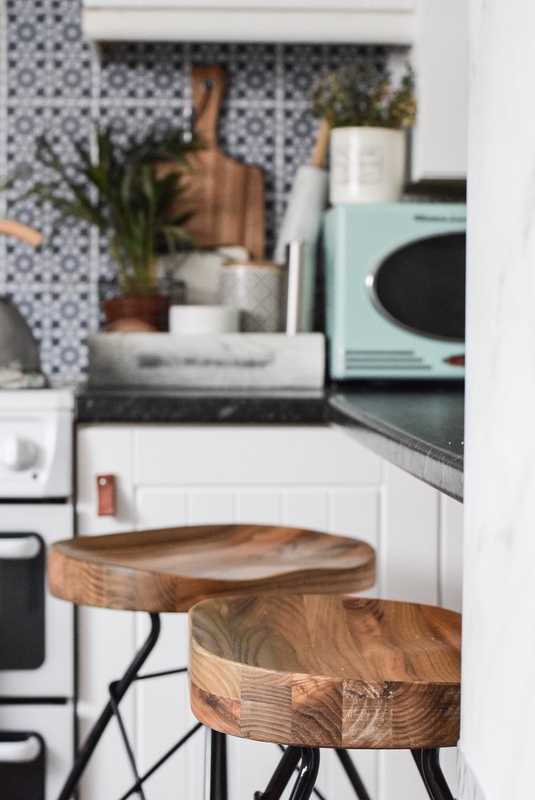 If you have a little breakfast nook like ours then updating your Kitchen stools is a really affordable way to inject your own style in to a kitchen you can’t change. I cannot rave about Cult Furniture enough, they have some seriously cool stuff and if you haven’t checked out their Website then you must. If you live in a rental property please don’t think you can’t make changes because there are ways to put your stamp on your home that are fully reversible when you leave the property. Loved this post? Why not share it? 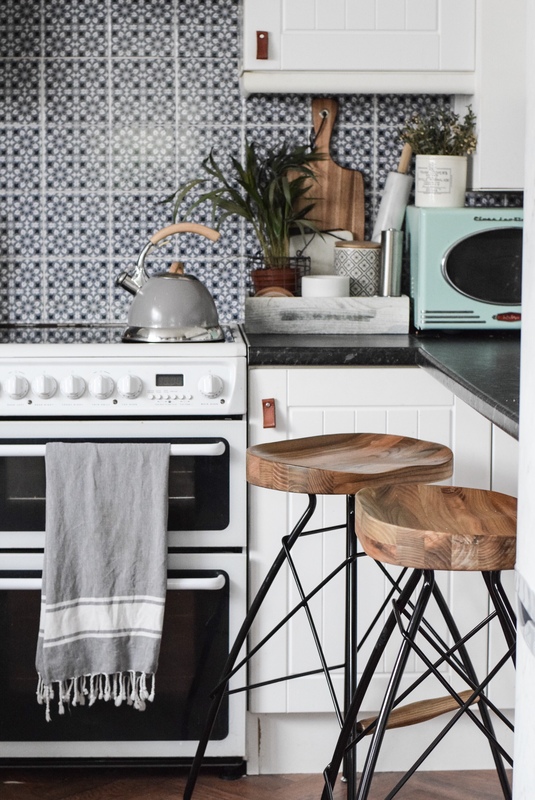 6 ways to update your home for Spring for less than £30….